Salvation And Survival: Ignore God's Calendar At Your Own Risk! Ignore God's Calendar At Your Own Risk! How do you think you would live your life if you didn't have a calendar? Would you miss important dates and appointments? Just how would you live your life differently? Would the passing of time matter; or how would you keep track of forecasts, predictions, and forewarnings? On a very simple level, think of it this way ... without a calendar, how would a farmer know when it was the proper timing to plant his crops? Or, if a doctor tells you that you only have a few months to live, how would you keep track of time, and how would you spend those remaining days? Well, since the world was created, man has turned to the heavens to track time and to prognosticate about his future. But in these days of such advanced technology, we are looking down at our computers or our phones ... and I fear that it may jeopardize our survival. We would do well to listen to such learned men as Jonathan Cahn, author of “The Harbinger” and “The Mystery of the Shemitah,”; both books that point us to God's signs and signals for the future of man. This year, 2015, is remarkable for heavenly portents of God's design for this world. They have not gone unnoticed by secular man; but their weightier significance is lost on the uneducated. So let me attempt to enlighten you, and I think you will find that what I am about to disclose is -- at the very least -- fascinating. And you just might find that the implications are astounding! You might have heard meteorologists and weather forecasters predicting a solar eclipse on March 20th, just a few days away. There has also been much talk about the "Blood Red Moon" events of 2014-15. Since I see all things through a Biblical worldview, it shouldn't surprise you if I point out that these events and dates coincide with a Biblical calendar instituted by God. After all, He tells us in Genesis 1:14 that He created the lights in the heavens "[to mark] seasons, days, and years". These "lights" include the sun, moon, and stars. So, taking the next step ... what do I mean by Biblical calendar events? Do I mean to say that God has established certain days and holidays that can be tracked in the heavenly skies and on an earthly calendar? Absolutely! Of course, man in the form of Julius Caesar and Pope Gregory XIII had to go and mess with the Jewish lunar calendar, as established by God. So if we are to understand the exact dates we are about to discuss, then it is important to keep to the Jewish Calendar. Now, it is also important for us to realize that the Hebrew people have counted and observed 7-year cycles in their agricultural labors, as mandated by the Torah for the Land of Israel -- and they still observe this 7-year cycle in contemporary Judaism. The 7th year in the 7-year cycle is called a Sabbatical year (God rested on the 7th day, the Sabbath), or a Shemitah year. The Hebrews were to let the land rest, and were promised bountiful harvests if they followed this commandment. They were "to release" the land from its activity, as well as releasing their brethren from their debts. It was to be a year of freedom and relying on God. Furthermore, there was a certain perfection of the Sabbath Year legislation. It provided for a double portion of rest every 50th year. Each 49th year would be a Sabbath Year (7 x 7), followed by a Jubilee Year in the 50th, so that for two consecutive years the people would be bound to restore the land, restore personal and economic freedom, and depend on God. Land reverted back to its original owner, and slaves were set free. It was to be a time of liberation and celebration! So why should all this be of interest to us? Well, it turns out that there are a tetrad of Blood Red Moons in 2014-15, PLUS this event coincides with the beginning of the “Shemitah” as well as a “Jubilee Year”. That's right! There is a convergence of all these God-ordained events within the time-frame of one year! The current Shemitah Year began on September 25, 2014, and runs to September 13, 2015. And let's not forget the Blood Moons and the upcoming Solar Eclipse. In the Jewish tradition, a Lunar Eclipse has forecast a bad omen for the Jewish People or the Land of Israel. A Blood Moon has meant that a sword (or judgment) was coming. 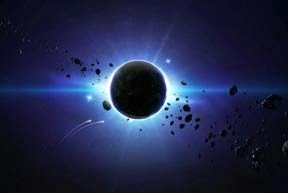 A Solar Eclipse has pointed to a bad omen for the world. So, if we are to give any of this credence, we should be able to point to incidents in history in which these events have occurred and in which these predictions actually happened, right? • Four TOTAL lunar eclipses occurred on the Jewish Passover and Feast of Tabernacles in 162 - 163 AD, coinciding with the worst persecution of Jews… and Christians in the history of the Roman Empire. Within 3 years the Antonine Plague killed eight million people, a third of the population. • Four TOTAL lunar eclipses occurred on the Jewish Passover and Yom Kippur Holidays in 842 - 843 AD. Shortly after the eclipses the Vatican church in Rome was attacked and looted by an Islamic invasion from Africa. • Four TOTAL lunar eclipses occurred on the Jewish Passover and the Feast of Trumpets Holidays in 1493 – 1494. Only months after King Ferdinand and Queen Isabella of Spain ordered all Jewish people to leave the country (after about 200 AD, Spain became and remained a second Jewish homeland for well over a millennia. So deeply woven into the fabric of Spain are the Jews that neither history can be fully studied without considering the influence of the other). • Fouyr TOTAL lunar eclipses occurred during the 1948-49 time period (one year) of the founding of the modern nation of Israel. • Four TOTAL lunar eclipses occurred on the Jewish Passover and Feast of Tabernacle in 1967 - 1968 coinciding with the 6 Day War when Israel recaptured Jerusalem. • Shemitah year 2001: America was attacked, killing nearly three thousand people on 9/11 and this sad day became America's new day of… discredit and humiliation! • Shemitah year 2008: America experienced a stock market crash on September 29 when the market fell 777 points in one day. It was the greatest one-day decline in the history of Wall Street. Author Jonathan Cahn is quick to point out that these events are synonymous with the 29th day of Elul on the Jewish calendar (which corresponds to our August-September). 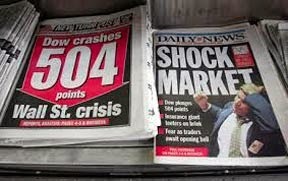 The two biggest single-day stock market crashes in U.S. history occurred on the 29th of Elul -- Sept. 17, 2001 and Sept. 29, 2008. In the 2008 crash, the Dow fell 777.7 points on the news that the House of Representatives voted down a $700 billion bailout deal. (Perhaps you've heard that the number "7" has special meaning in a Biblical context ... divine completeness). Kind of eerie, huh? Now, if you're good at math, you've already figured out that the next Shemitah year is this year, 2015. And this time, the 29th of Elul will occur on September 13, 2015. Should we be looking for another catastrophic event to occur? Don't put it past God, says Mr. Cahn. "I see a similar phenomenon playing out in America. [One can trace] the first signs of judgment to 1973, a Shemitah year, following the removal of prayer from public schools in the 1960s and then the Supreme Court decision that legalized abortion. That started a downhill spiral, with each judgment getting more pronounced, including the stock-market crashes of 1980 and 1987, followed by terror attacks and a market crash in September 2001, then another financial collapse seven years later in September 2008. The present Shemitah year started Sept. 25, 2014, and is now halfway to its climax in September 2015." Is anyone willing to bet that we've changed course enough as a nation to avoid further judgment? Combine all these occurrences with the Blood Moons and the Solar Eclipse, and it looks like a possible recipe for some sort of cataclysm or catastrophe. Admittedly, if you have no interest in the Bible or God's sovereignty, or just think this is all serendipity at its finest, then you are not going to give this any credence. That is certainly your prerogative. But there is enough evidence for me to keep a watchful eye on the heavens and to be cognizant of what day it is. Might it not be wise for you to at least consider what the centuries have disclosed? 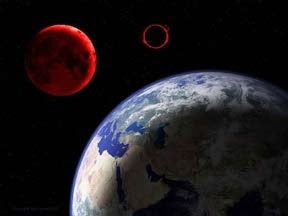 For more information about the Blood Moons, click here. If you would like to know about Jonathan Cahn's warning to America, please click here. Luke 21:36 "Be always on the watch, and pray that you may be able to escape all that is about to happen..."
I just read your above article. It is hard to believe that some are still taking lightly all of these signs. I have been praying Luke 21:36 for some years now. What I wanted to point out (you may already be aware of it), but some coincidences (for the lack of a better word) within your article and the previous article 'This is the end? Pope gives up cryptic hint' in the 'From the Prophecy Update' site 17/3/15. You both write about the Vatican and Spain. Lately, I keep getting the feeling that history might be going to repeat itself. Yes, Steph, things are coming into alignment with ancient prophecies, aren't they? Those of us who are awake will make sure our lamps are filled with oil, and we will not be late for the Wedding Banquet. Thanks for your insightful comment! The bible states that no one knows the hour or the day of judgement. We should be living in grace as much as possible. We are most likely to die of other things than that. I let God worry about that day. Keep myself in grace as best I can and He will protect his followers. Of that he promised. what will be, will be. You are right, the Bible says we are not to concern ourselves with the hour or the day of God's judgment. But Jesus does tell us (TWICE!) to watch and take heed (Mark 13:32-37) so that we would recognize the time and seasons. His words give us the thought that up to that time, the Father had revealed the times and seasons connected with His plans to no one, not even to our Lord Jesus. So instead of believing that our Lord rebuked investigation and interest in the times and seasons, and forbade such examination, the very reverse is true. His words clearly show that though the times and seasons were not yet given to man to know, they (God's appointed times -- His Feasts) would be very important in the future, and would be revealed to those watching. So Christ urges them to “take heed,” and not to allow indifference to come over them, but to “watch” continually, that they might know when the due time should come. I believe that we practice such indifference at our own peril.